Women and girls from from black, Asian and minority ethnic backgrounds have been celebrated for the significant contributions they make to Welsh life. In total, 23 candidates were nominated for recognition in seven categories, including business and art, culture and sports, as well as young achievers. Winners were announced at a ceremony in City Hall on Saturday night. Women of ethnic backgrounds who had been victims of violence were also recognised. The Ethnic Minority Welsh Women Achievement Association awards, held every two years, aim to identify female role models. Fatma Alan, who was recognised for her work after suffering domestic abuse, said it was important people "go out and speak about it - so people act faster". "People are stuck in that situation for so long because they don't know what it's like out of the relationship - they're scared that the outside could be worse. I didn't know there was support out there - I didn't know organisations existed to help and support." Science, technology medicine: Prof Kamila Hawthorne, vice chair (professional development) at the Royal College of General Practitioners and associate dean for medicine at the University of Surrey. Management and leadership: Uzo Iwobi, chief executive officer of Race Council Cymru, who was also named ambassador for the awards. Arts, culture and sports: Leanne Rahman (joint winner), arts and education project administrator for the Arts Council of Wales, who co-ordinates Black History Month Wales. Arts, culture and sports: Angeline Tshiyane (joint winner), who set up a support group for Zimbabwean women in Wales called Madzimai Pamwe and works promoting sports development with people of ethnic backgrounds. Social and humanitarian: Martha Holman, founder of the Love Zimbabwe charity and Love Zimbabwe Fair Trade Company that imports and sells crafts from Zimbabwe. Self development: Versha Sood (joint winner) a registered nurse who leads Hafod dementia care in Wales and helps organise cultural events across Indian British and other community associations in Cardiff. Self development: Fateha Ahmed (joint winner) who works fulltime with Race Equality First in conjnction with doing volunteer community work. Business: Derin Omole, who combines her work as a sexual health professional with her business Twale Cuisine Limited. Young achiever: Queena Lee, who is studying in Cardiff while also heading a team of 80 volunteers with the ACE Cardiff charity, which promotes the importance of equal educational opportunity. Fatma Alan: Suffered domestic abuse and has gone on to complete a BSc (Hons) in Dental Technology. Omonigho Idegun: After being trafficked to the UK from Nigeria, she is now an event organiser for vulnerable people. Gaynor Legall: Described as "a formidable champion of ethnic minority women in Wales" Ms Legall has served on the city council before going on to work in the voluntary sector and then the Welsh Assembly. Dr Layla Jader: After leaving her home country of Iraq, Dr Jader worked for 37 years in the NHS and was a consultant in public health genomics. Norma Glass: The Welsh representative on the UK Board of Deputies of British Jews, she was recognised for her "lifetime commitment to community cohesion, integration and racial equality". 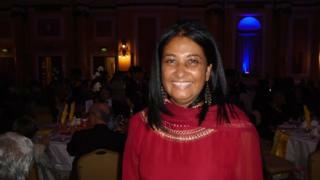 Chantal Patel: Came to the UK from Mauritius to train as a nurse before going on to qualify as a solicitor. Now lectures throughout the UK on mental capacity and medical documentation.